It is every cricketer’s dream to walk out on to the middle to play for England against the old enemy Australia in an Ashes showdown. And for Northampton Saints Club cricket stalwart Mick Allen, that dream will come true when he heads Down Under this winter - at the age of 70! Allen is a very familiar face on the Northamptonshire cricketing scene, having played for his club, Saints, for a grand total of 56 years. He has always loved playing cricket, and has spent years coaching it too, with generations of young cricketers going through the Saints youth system, where Allen was always available to pass on tips and advice. So after playing for 56 years, and coaching youngsters for 40, it’s probably fair to say he has devoted his life to the sport. And now, having bowled 1,000s of overs, faced 1,000s of deliveries, and enjoyed (endured?) 1,000s of hours running around the outfied (as well as enjoying 100s of post-match pints! ), Allen is preparing to play out what will surely be the highlight of his cricketing career - an Ashes series in Australia. He has been selected for the England Over-70s team for their tour of Australia next February and March. The 18-strong squad heads Down Under on February 21, and on the three-week trip the England senior team will take on Australia in five one-day internationals, playing in Brisbane, Melbourne, Perth and Adelaide. So how did the chance, and the international selection, come about? 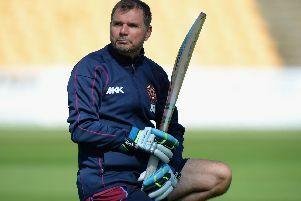 “Having played for the Northants Over-50s and Over-60s, people get to know you can do a bit of this or that,” said Allen, who was born in Northampton, and has lived in the town all of his life. “I have always been able to run around, which helps if you are over 60, or over 70 as I am now. “So I got put forward I presume by my Over-60s captain, and then I was invited to a trial in Lutterworth in August, where 20 blokes turned up. So, what is he expecting from the Australia team? Allen said: “Our captain insists Australia will be fitter than we are, they will be faster than we are, and he is insisting we go to the gym, which I have never done! “I think I’ll just be carrying on as I have always done. I still play table tennis, so that keeps my eye in as my eyesight is still good, and I was still playing cricket for Saints last season. Doing his best is something Allen has always done since he first walked into Saints’ Birchfield Road East ground in 1961 - ‘it was 50 yards from my house’ - and he admits he has no idea how many wickets he’s taken or runs he’s scored. A wily spin bowler (“I’ve always been a slow bowler, it’s supposed to be leg-spin, and I still don’t turn it and still get wickets!”), Allen said: “I’ve playing 50 years, and when I first started we played Saturdays and Sundays. “So if it’s 20 weeks in the season, that’s 40 games every season over all those years. When your playing career stretches back as long as Allen’s, then there are going to be plenty of highs and lows, plenty of memorable moments and many, many team-mates and opponents. So, which players stand out as the finest Allen has had the pleasure to share a field with? “When I first started at Saints, there were people like Lynn Wilson, Mike Warrington, Peter Arnold, who was ex-County, and I can’t name them all because I will miss some out,” he said. “Keith Jones who captained me, and came from Middlesex to the Saints, I would say he was the most professional captain I played under. When Allen and the Saints were at their peak in the 1970s and 80s, they were recognised as one of the best club sides in the country, regularly winning the Central League title, and regularly competing in the national KO club competition as well. That saw Allen come up against some greats of the cricketing world, so which opponents stand out? “When it comes to opposition, I have played against Graham Yallop from Australia, Alvin Kallicharan, Mushtaq Mohammed, but I can’t remember the exact years,” he said. Saints has always been Allen’s club (“It’s always been the Saints. It was handy for me as I never had to drive anywhere... I have never driven in my life and have been playing for all these years and always got home somehow!”), but he has also over the years played for other teams, such as Primrose Hill, the Boys Brigade when he was a child, and also Northants Amateurs. As well as memories, Allen has scores of long-lasting friendships from his years playing cricket, as well as his times playing football and rugby for Old Northamptonians, for whom he played rugby until he was 60. Barely a day goes by where Allen won’t bump into somebody in the street who he either played cricket with or against at some point over the years. “League cricket has got a bit more intense I think,” he said: “People appeal when they shouldn’t appeal and know it’s not out, so why do they bother doing that? “Then the kids follow it, and I have done a lot of junior cricket and kids are appealing from deep extra cover for lbw, because they all go up, and it is disappointing. He also feels the social side of the sport is changing, with some teams no longer staying on after games for a drink and a chat, but Allen makes sure and his team-mates, whenever he plays, still maintain this tradition. How friendly and social the tour to Australia is going to be this winter is yet to be seen. The Aussies have obviously been famed over the years for their on-field ‘sledging’, and Allen is expecting some noise from the opposition when he takes them on Down Under, going by the theory that leopards never change their spots! And he added: “I have never been a sledger, because it can always come back and hit you in the face, and if you say something to somebody they can get you out the next ball or whatever. “I have always played to win, and if on the day we have’t been the best that’s how I read it. “I didn’t get upset if we lost a game, unless we deserved to win and then it’s all gone wrong in the last over or whatever, and that has always been my outlook on all sports. Allen will now be hoping he and his England team-mates can be the best on the day when they compete for the Ashes. It is such a fantastic opportunity for a man who has given so much to cricket in Northampton, but to undertake the trip Allen has to raise the money for the cost, as it is self-funded. “We anticipate we’ll need to raise £5,000,” said Allen. Allen’s daughter Rovinj - who in the past has also represented England at netball so there must be something in the blood! - has set up a Just Giving page to try to raise the funds.